This is Part 2 of 4 to set things straight about how elections work in Virginia. Here, we address myths about polling places and the voting process. Myth 1: If you haven’t checked in by 7 pm on Election Day, you won’t be able to vote. 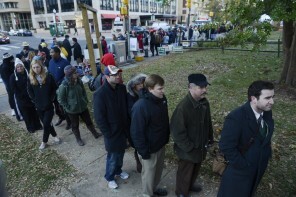 As long as you are in line by the time the polls close at 7 pm, you will be allowed to vote. It doesn’t matter how long it takes you to get to the front of the line. You do, however, need to be in your correct polling place, where you are properly registered, for your ballot to count. If you show up at 6:55 at the wrong polling place and can’t get to your correct location, the only thing the poll workers can do is offer you a provisional ballot. If it turns out you were at the wrong location, unfortunately that provisional ballot can’t be accepted. Myth 2: If you wear partisan or campaign attire to your polling place, you won’t be allowed to vote, or you’ll be told to remove it. This is a law that varies from state to state. In Virginia, voters may wear buttons, stickers, and campaign apparel when they come to the polls to vote, as long as they are not actively campaigning inside the polls. Campaigning is prohibited within 40 feet of the outside entrance to the polling place. Myth 3: Photography, including “ballot selfies,” is not allowed in polling places. This is another law that varies from state to state. In Virginia, ballot selfies or voters snapping a photo of their ballot are in fact permitted, providing they are not overly distracting to other voters. Media are also permitted to film or photograph inside the polls, but they cannot compromise a voter’s privacy or take close-up photos without permission. Because of our proximity to Washington, we get a lot of media coverage at our polling places during busy elections. If you do not feel comfortable being filmed or photographed, even from a distance, please contact the nearest poll worker, who will convey that information to the media personnel. Myth 4: Children are not allowed in voting room. Virginia law specifies that children 15 and younger may accompany their parents at the polls on Election Day, which includes access to the voting booth and the scanner. Often parents will permit their children to mark their ballots and insert them into the scanner. We even give them “Future Voter” stickers! Virginia also permits high school students to be present in the polling place as Election Pages. These Pages help the poll workers by greeting voters and providing them with information, assisting voters with special needs, and specific other tasks. All Pages must apply for the position and attend training. In Arlington, they will also be wearing name tags so you know they are authorized to be present. What about pets? Service animals are always permitted. Whether or not you can bring little Muffin, your non-service fur baby, inside will be at the discretion of the Chief Election Officer. If your dog is well behaved and quiet, and it’s not too busy when you arrive, the Chief and other officers may be fine. But don’t be offended if you are instructed to tie your pet up outside because they believe its presence will be disruptive. Some people are allergic to dogs, and the poll workers don’t appreciate having to put up with barking or yapping. Nor do they want to have to clean up any accidents. Myth 5: You can’t bring anything into the polls with you to help you vote. You can bring sample ballots, flyers, or voting guides with you to help you vote. It’s an excellent idea to study these materials before you go to the polls so you’ll know exactly which selections to choose on your ballot. You can also use your cell phone – with sound turned off- in the voting booth to look up information online, but audible phone calls are prohibited. So, Google is fine but calling your BFF is not.